Cerebral Palsy in Infancy is a thought-provoking book which introduces a new way of thinking on the development and use of interventions. Relevant to current practice, it advocates early, targeted activity that is focused on increasing muscle activation, training basic actions and minimizing (or preventing) mal-adaptive changes to muscle morphology and function. The authors present recent scientific findings in brain science, movement sciences (developmental biomechanics, motor control mechanisms, motor learning, exercise science) and muscle biology. This knowledge provides the rationale for active intervention, underpinning the need for an early referral to appropriate services. The book features methods for promoting relatively intensive physical activity in young infants without placing a burden on parents which include assistive technologies such as robotics, electronic bilateral limb trainers and baby treadmills. Cerebral Palsy in Infancy begins by specifying the guidelines for training and exercise, outlining the rationale for such intervention. It goes on to cover the fundamentals of neuromotor plasticity and the development and negative effects of limited motor activity on brain organization and corticospinal tract development. Neuromuscular adaptations to impairments and inactivity are discussed along with the General Movement assessment that can provide early diagnosis and prognosis, facilitating very early referral from paediatric specialists to training programs. The book ends with a section featuring various methods of training with the emphasis on preventing/minimizing muscle contracture, stimulating biomechanically critical muscle activity and joint movement. 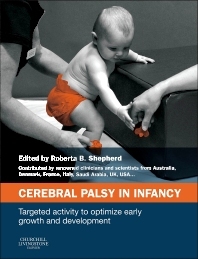 An ideal clinical reference for those working to improve the lives of infants suffering from cerebral palsy. CONTRIBUTORS: Adel Abdullah Alhusaini (Saudi Arabia); David I. Anderson (USA); Nicolas Bayle (France); Roslyn Boyd (Australia); Giovanni Cioni (Italy); Diane L. Damiano (USA); Janet Eyre (UK); Linda Fetters (USA); Mary Galea (Australia); Andrew M Gordon (USA); Martin Gough (UK); Richard L Lieber (USA); Jens Bo Nielsen (Denmark); Micah Perez (Australia); Caroline Teulier (France). "This book provides a comprehensive overview of the challenges of motor development and the consequent impact of poor motor function in later childhood for infants with cerebral palsy (CP)." "This book provides a comprehensive overview of the challenges of motor development and the consequent impact of poor motor function in later childhood for infants with cerebral palsy (CP). This book will provide a useful reference for therapists working with infants and young children with CP, particularly those who have an interest in understanding neuromotor and musculoskeletal development and the impact of CP on mobility."